These are the TRA3080 Female Traxxas Connectors Plugs Only (No Wires). The Traxxas High-Current connector flows current like a firehose with virtually zero voltage loss due to power-robbing resistance. The patent-pending Traxxas connector is a better-engineered solution for real-world use. Large, textured surfaces on the plug bodies are easy for fingers to grip and the clever reverse-polarity protection makes Traxxas connectors virtually impossible to plug in backwards. Shrouded wire connections eliminate the extra steps to install heat shrink tubing. Beefy, gold-plated copper terminals with large, spring-loaded contact areas ensure a perfect connection every time. 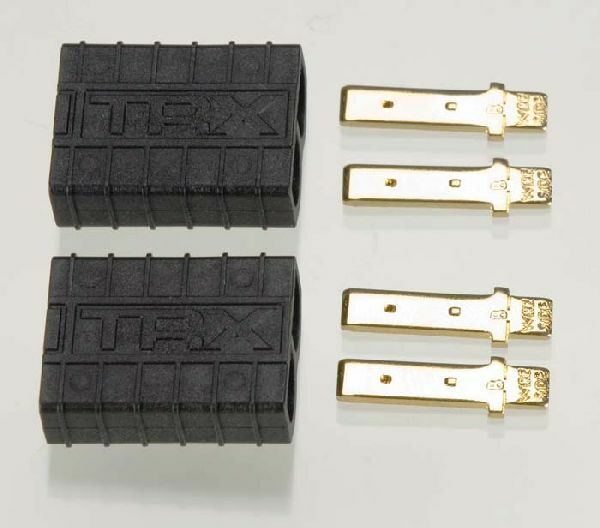 Even after thousands of uses, Traxxas connectors maintain their precision feel and incredibly low resistance.